New Jersey has beautiful beaches along our lakes, rivers and oceans. Even better than spending a day on these bodies of water is spending the night. There’s nothing like waking up to the gorgeous glow of the sun gleaming on the water. These 10 spots allow you to do just that, and to top it off, they’re all great values. There are several spots you can camp in Bass River State Forest, but by far the best place to rest your head is one of the park's six lakefront cabins. Along the north shore, these cabins feature full kitchens, private baths and enclosed porches looking out on the lake. For a more rustic experience, there are also six lakeside shelters with shower facilities within walking distance. 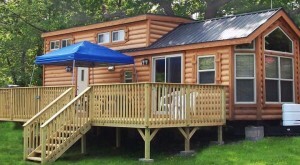 Cabins run New Jersey residents just $75 per night, shelters are priced at $48. Camping is available until October 31st. Rent out a lakefront Captain's Cabin or Suite for luxe amenities with waterfront views. They offer heat, air conditioning, refrigerators, microwaves, private powder rooms (toilet/sink) and more. Rates vary depending on the season, and camping is available from mid-April until the end of October. From Memorial Day - Labor Day, guests can enjoy a free tug boat ride on the lake, along with other water activities. 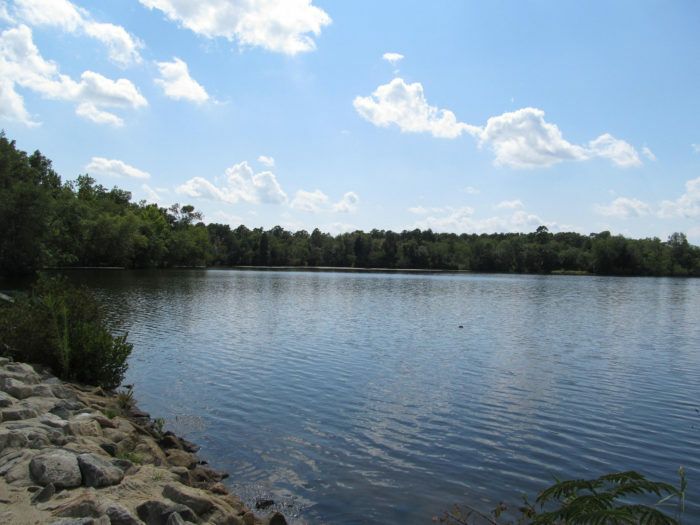 While Lake Marcia may be more popular (swimming is permitted), Sawmill Lake offers camping along its shores. 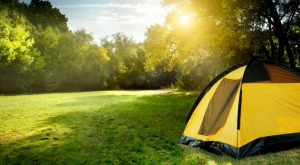 Tent sites are available until October 31st for just $20 per night. 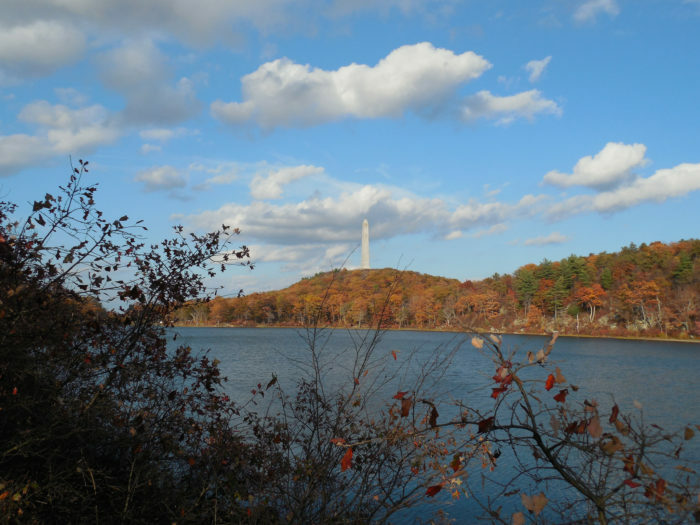 If you're looking for something that feels more like home, there are two cabins available on Steenykill Lake, both offering 3 bedrooms, a bathroom, kitchen, living area with wood stove and electricity. These cabins will cost New Jerseyans just $75 per night ($85 for non-residents) and are available until October 15th. 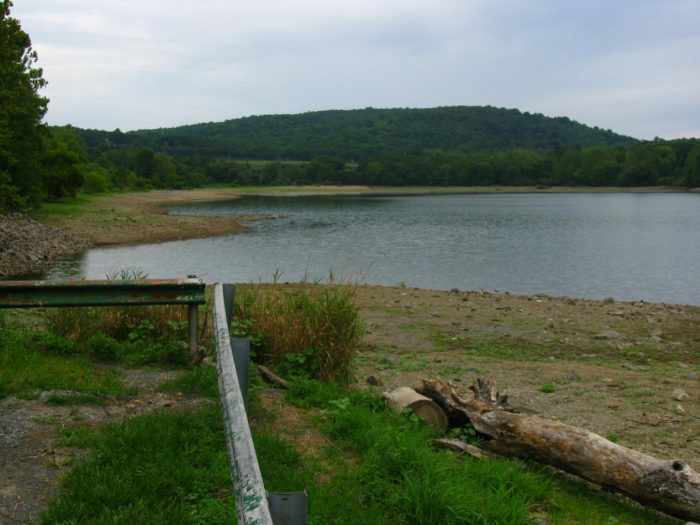 Both Sawmill and Steenykill Lake allow boating and fishing. 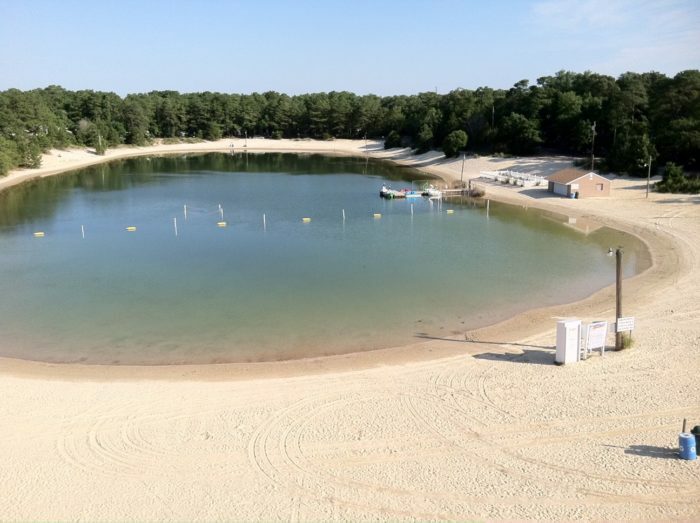 There are seven trailer sites here located right on the beach (T202 -T214), and many more with lake views. Beachfront amenities include volleyball, shuffleboard, swimming, a playground and paddle boat rentals. Park amenities include a fishing pond, pool, mini-golf, arcades and more. Lake area trailer sites range from $52 -$95 per night depending on season. 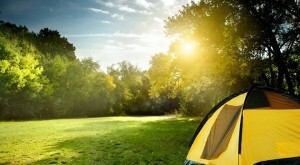 Camping is available from mid-April to mid-October. There are 56 tent and trailer sites here, but for waterfront views, opt for a group campsite or cabin. 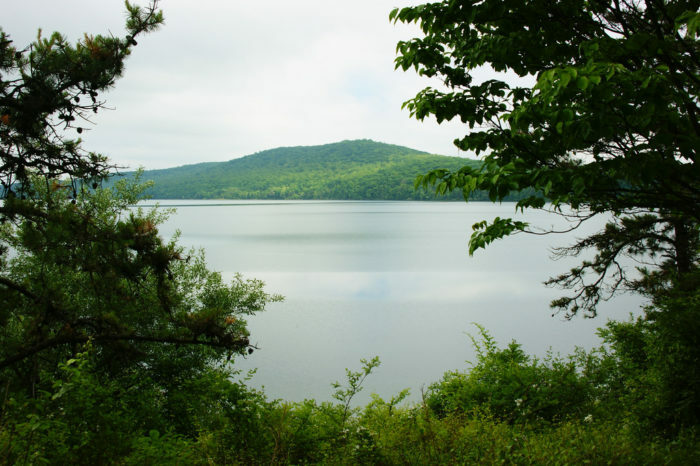 The group campsites are located on Parvin Lake and offer fire rings and flush toilets. 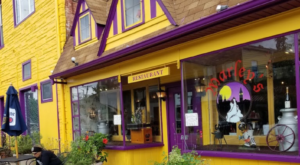 They run New Jersey residents $50 per night and are available until October 31st; each site accommodates up to 25 people. 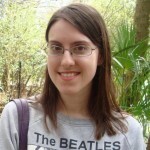 Cabins are located on Thundergust Lake and offer full kitchens, private bathrooms and two bedrooms. 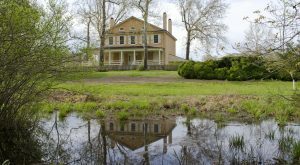 Cabins start at $55 per night for NJ residents and two of the cabins are ADA accessible. Available until October 31st, cabins must be rented for a seven day minimum until Labor Day. 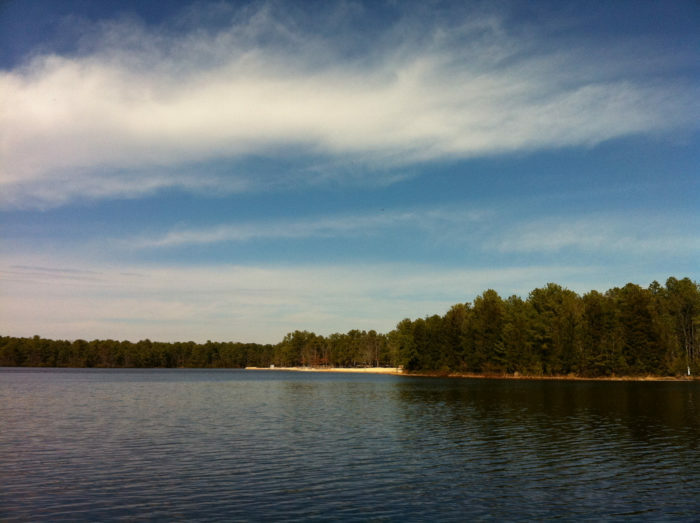 The camping area at this park is surrounded on three sides by the stunning Spruce Run Reservoir. There are 67 tent and trailer sites with picnic tables and fire rings, and three basic shelters with bunks and a wood stove. 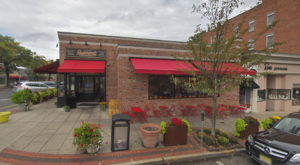 Flush toilets and showers are within walking distance. Fishing, boating and swimming (seasonally, when conditions allow) are permitted. Camping is available until October 31st; tent/trailer sites are $20 per night, shelters cost $48 per night. 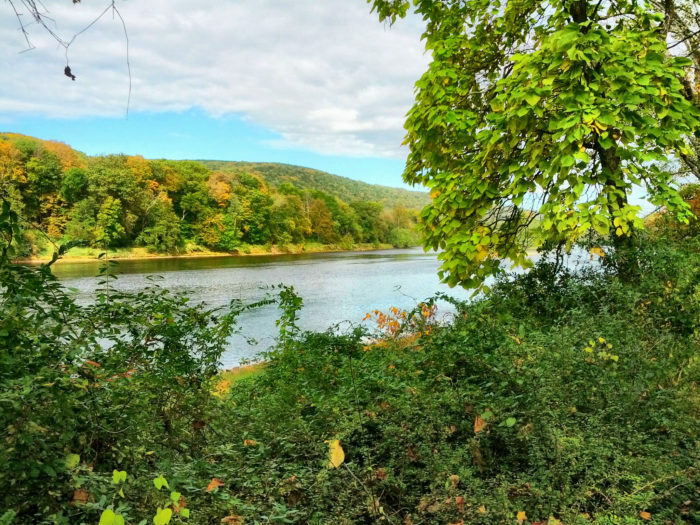 Though not a sandy beach, several sites are right along the Delaware. You'll enjoy gorgeous scenery and endless opportunities for boating. Tent and trailer sites are just $20 per night for New Jersey residents ($25 for non-residents) and they are available from April 1st - December 31st. 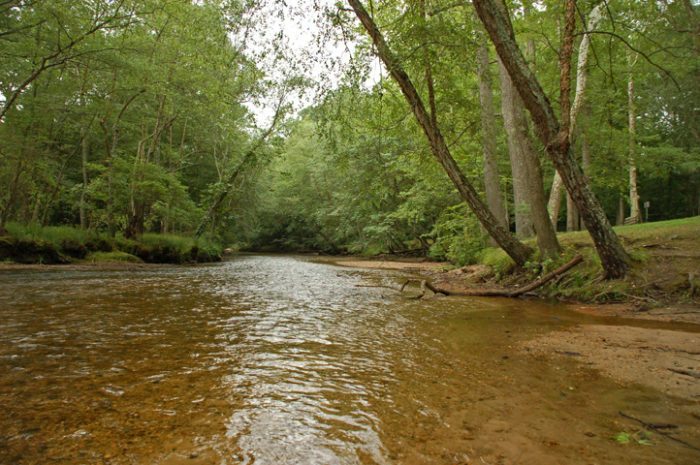 Should you wish to swim in the Delaware, Turtle Beach (lifeguards in-season) is just a short drive from the camping area, right off Old Mine Road. 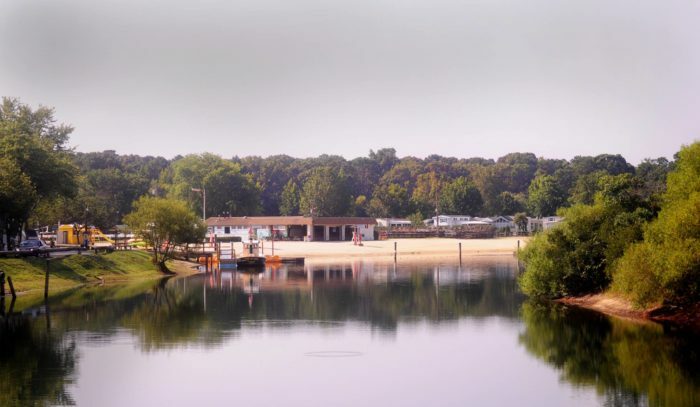 This seasonal RV park offers several beautiful beachfront sites on the Egg Harbor River. The park doesn't have much of an online presence, so I've included a picture of the river near Weymouth Furnace. The resort's beach area is quite different, capable of docking large boats. Beachfront sites will run you $5,000 for the season. Park amenities include a pool and clubhouse. 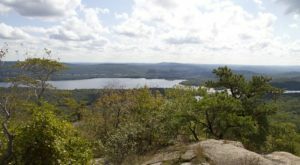 The deepest lake in New Jersey, Round Valley Reservoir offers hiking, biking, swimming, scuba diving and the most rustic camping experience in New Jersey. All sites at Round Valley are primitive and require hiking or kayaking to reach. The spectacular waterfront views are worth the effort. You'll finding drinking water and pit toilets within walking distance; sites are $17 per night and camping is available until October 31st. For the second year in a row, Seaside Heights is offering all-ages oceanfront camping on select dates. While several dates were free, camping on August 29th (the last overnight event of the summer) will run you just $6.27 per person, including all fees. Tickets must be purchased online, and are still available at press time. If you're not able to attend, don't despair, the beachfront camping has been tremendously popular and will hopefully be offered again next year. Bring a tent (up to 10' x 10'), cooler (no alcohol) and your favorite beach games, and get ready for a night of fun. Check-in runs from 7:00- 9:30 p.m., and re-entry ends at 1 a.m. The event ends by 10 a.m. on August 30th. 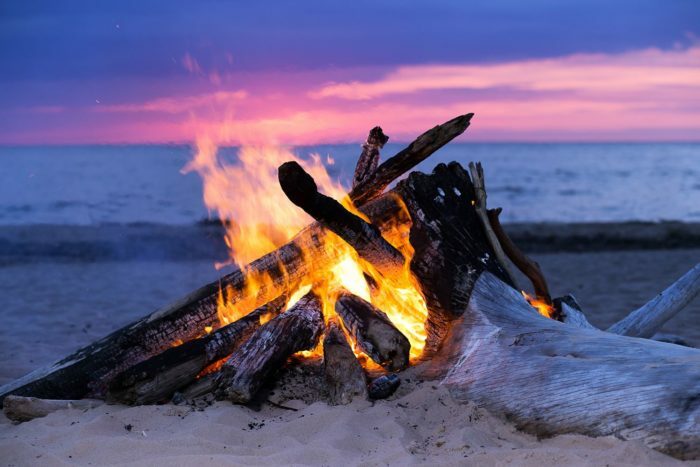 The town will be hosting a bonfire on the beach for everyone to enjoy. For more information, click here. While I think all of these are amazing options, I was particularly excited about the oceanfront camping at Seaside – which of these places are you most likely to visit? 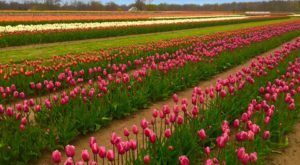 For more camping options in New Jersey, see my previous post: These 12 Rustic Spots In New Jersey Are Extraordinary For Camping.